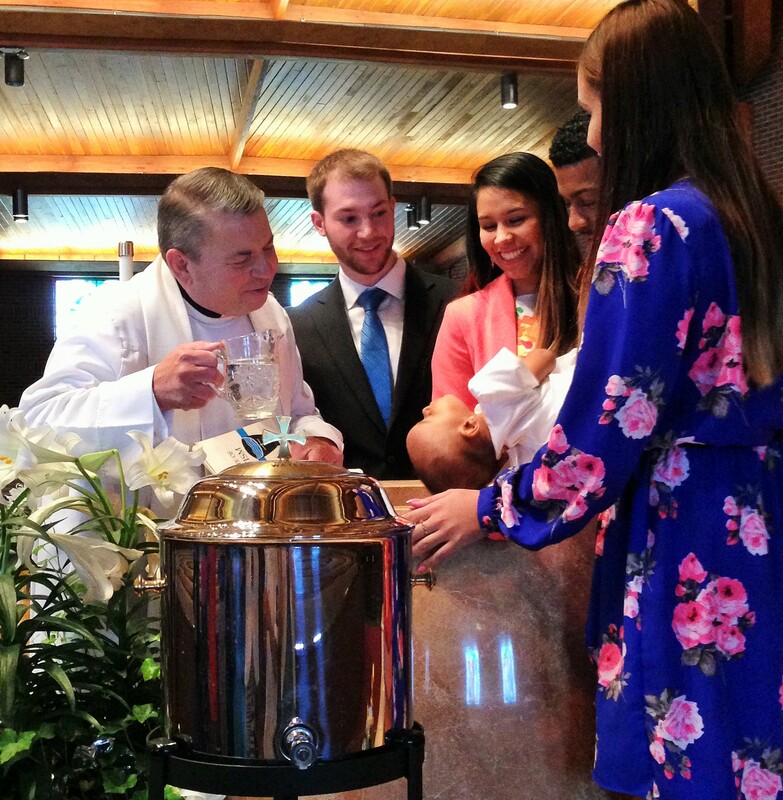 Do you have a newborn or child who hasn’t been Baptized? 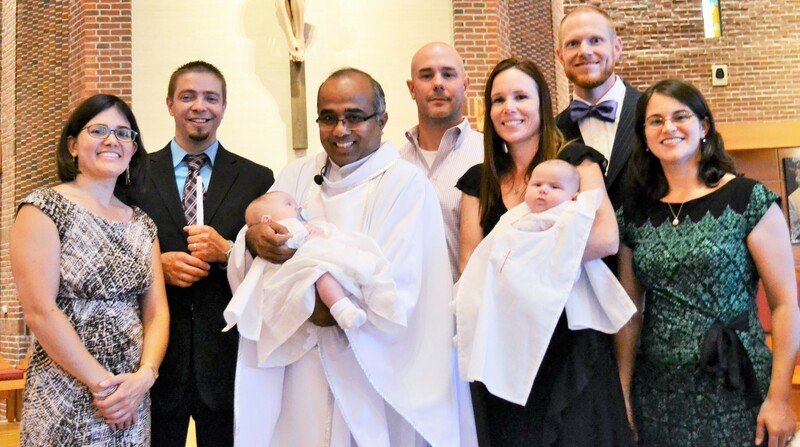 Baptism Workshops are offered by Msgr. Walter on the third Sunday of each month, directly after the 12noon Mass. No registration is needed for the Workshop – just sit in the first pew in front of the ambo. The Workshop allows expectant/new parents to come to a greater understanding of the Sacrament of Baptism as well as review the Baptism Rite used by the Church for the ceremony. 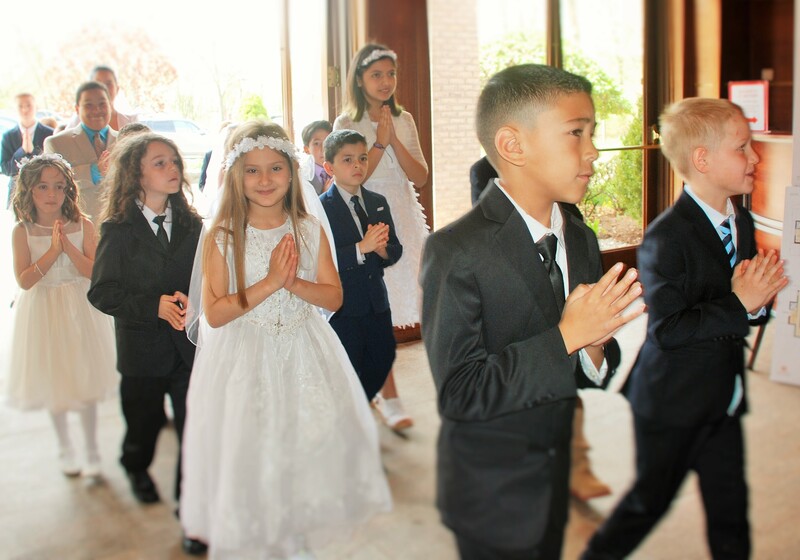 After you attend the Pre-Baptism Workshop, please complete the forms from the workshop so that you can contact our Baptism Coordinator, Lorraine DeRosa, to schedule your child’s Baptism! Lorraine: lorraine.711@hotmail.com. El Sacramento del Bautismo se ofrecerá en español o bilingüe para todos los que estén intersados. De igual manera, estamos trabajandro para que el curso pre-baustismal sea bilingüe. Para mayor información comunicarse con Monseñor Walter C. Orlowski pastor de la Iglesia o con la secretaria de la parroquia. The Sacrament of Reconciliation, also known as Confession, is one of the Sacraments of healing—the ways in which our sins are forgiven. 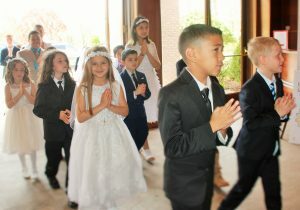 First Reconciliation is received prior to receiving the Sacrament of the Eucharist. Contact: Erma Moore, Director of Faith Formation: 203-838-3788, ext. 107; StMattRelEd@gmail.com. The Eucharist is the greatest of the Sacraments of initiation, the “source and summit of the Christian life.” In Holy Communion, we the Real Presence of Jesus under the appearance of bread and wine. 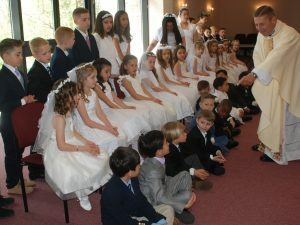 Preparations for First Reconciliation and First Eucharist are coordinated through our Faith Formation Program, whether your child attends public or Catholic school. Contact: Erma Moore, Director of Faith Formation: 203-838-3788, ext. 107; StMattRelEd@gmail.com. 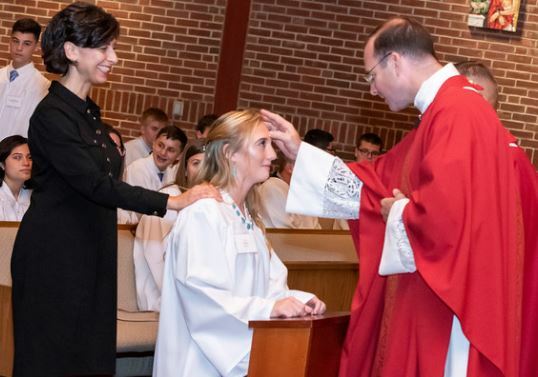 Confirmation completes the grace of Baptism by a special outpouring of the gifts of the Holy Spirit, which seal or “confirm” the baptized in union with Christ and equip them to share their gifts, live and give great witness to their faith as they build up the Kingdom of God. Preparation for the Sacrament of Confirmation takes place in the 9th grade, and the Sacrament is celebrated in the Fall of the 10th grade. Contact: Liz Reid, Confirmation Coordinator: 203-838-3788, ext. 107; StMattRelEd@gmail.com. This Sacrament is a visible sign of God’s love for the Church. 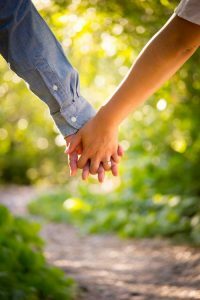 When married in the Church, a couple receive the grace needed for a lifelong bond of unity. Congratulations about your future together! We’re delighted and honored to help you prepare for this important step in your life. 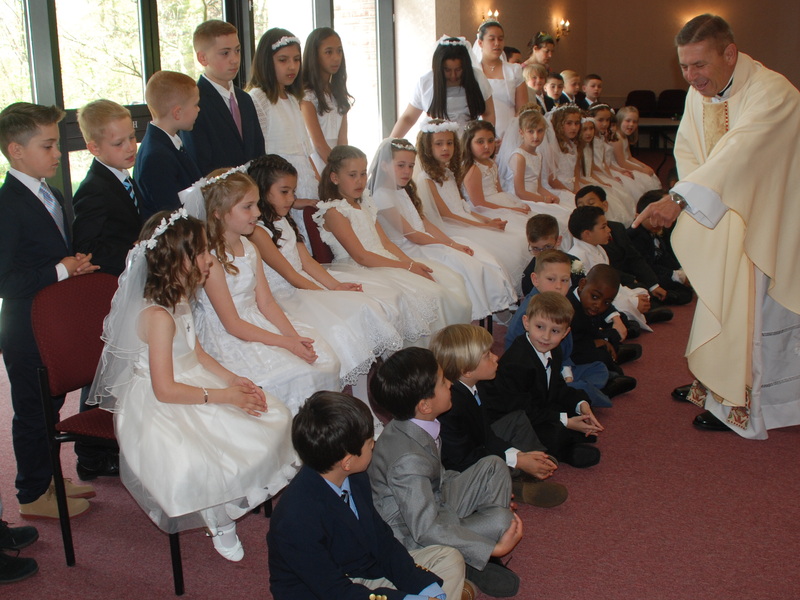 For information regarding preparation for the celebration of the Sacrament of Marriage, please contact Lorraine DeRosa: Lorraine711@ hotmail.com. This Sacrament gives strength and support and can be administered to anyone struggling with an illness. We believe that physical healing can occur through the great power of God. 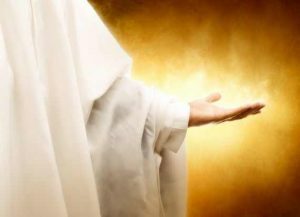 The grace that is infused through this special Sacrament is the reminder of the eternal presence of God in our human suffering. The priest blessing the oil of anointing asks God to “send the power of your Holy Spirit, the Consoler, into this precious oil. Make this oil a remedy for all who are anointed with it; heal them in body, in soul and in spirit, and deliver them from every affliction.” (Pastoral Care of the Sick, #123). If someone in your family is ill, please contact the Parish Office to arrange for a priest to bless them with sacred oils: 203-838-3788, ext. 101. 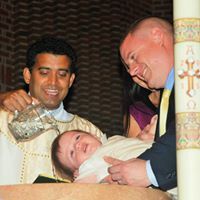 Those who receive the Sacrament of Holy Orders — as a deacon, priest or bishop — are consecrated in Christ’s name “to feed the Church by the word and grace of God.” If you are a boy or man who has questions or thoughts about vocations, please contact Msgr. Walter (ext. 127); Fr. Tomi (ext. 112) or Fr. Sunil (ext. 114).